album available on digital download! My album is now available on digital download. You can stream it on bandcamp if you click, here. This is the last few bars of me singing Nothing Compares To You, made famous by Sinead O'Connor, but originally written by Prince, as a tribute to him after his passing at the We Are One party celebration. I had an instore performance at Empire Records in St Albans where I performed songs from my new album, 'How Shall We Say Goodbye?' To buy a digital copy of the album, click here. I am delighted to have played a sell out show last night at award winning music venue, Green Note. Pictured above is guest horn player Thom Allard who stepped in to play on my final song, the closing track on my album which he and classical pianist Hara Kostogianni recorded live with me at Big Jelly Studios. This gig also saw the launch of the fully mastered version of my debut album, 'How Shall We Say Goodbye?' I am thrilled to have been a foundational artist performing at the inaugural gig to launch the Square Roots project. For event details click here. For more on the Square Roots Charity click, here. review of square roots green note show! A fantastic review by Folk and Honey of the sell out Green Note show last night which launched the Square Roots project. To read the review click, here. Square Roots aim to create an archive of music and history of the Anglo-American folk revival for future generations, as well as providing a platform for contemporary artists that draw inspiration from this scene. I'm thrilled to have been a foundational artist performing at the inaugural gig to launch this incredible project. For more on the Square Roots Charity click, here. square roots green note show sold out! I am delighted to announce that my debut show at Green Note, the inaugural gig of the Square Roots Project and the platform for the launch of my newly mastered debut album has completely sold out. I will perform alongside Dan Evans, the UK's leading dulcimer player for a night inspired by Jean Ritchie, who Joan Baez called, 'The Mother of Folk.' Ritchie was an interpreter of Mountain Music and her repertoire was a strong influence on the Anglo-American folk scene of the 60's. We'll focus on some of the songs that Ritchie herself preserved, as well as music that draws from the rich tapestry of the folk scene that she influenced. For full event details click here. For more on the Square Roots Charity click, here. A video of the song, 'Call It Home,' the closing track on my debut album. Talented film maker James Light has taken footage from my 2015 album performance at St John's Waterloo and turned it into a live video to accompany the track. This performance marks a milestone in the completion of the project to produce my debut album, 'How Shall We Say Goodbye?' Musicians Thom Allard (french horn) and Hara Kostogianni (piano) who feature in the video also play on the album recording. I am delighted to share the finished version of my album. This is the culmination of a year long project which started in early 2015 when having quit my full time job, I set myself the goal of making an album by the end of the year. It's been an incredible process of refining material, collaborating with musicians and producers and learning the many facets of crafting an album. The theme of the record is letting go which gives the album its name, 'How Shall We Say Goodbye?' When I was writing these songs I was thinking about the different ways we say goodbye throughout a lifetime and how this defines our humanity. The way in which we say goodbye can colour the experience that we have had and influence what it's possible for us to take away. I see the songs on this album as different textures of letting go. 'How Shall We Say Goodbye?' will be available online in March 2016 and if you come to a gig, you can pick one up even sooner. I have spent the day putting the final touches to my debut album, 'How Shall We Say Goodbye?' at World of Sound with fantastic mastering engineer Russell Dawson-Butterworth. In the making of this album I've learned just how vital the mastering process is to translate the detail, dynamics and texture of the studio tracks that gets squeezed down to become the stereo mixes that appear on cd's, iPods or online streaming. I'm delighted with the sound and feel of the album having mastered it with Russell and I'm looking forward to sharing the results of all who've contributed to the recording and production. 'How Shall We Say Goodbye?' will be available online by March 2016 and if you come to a gig, you can pick one up even sooner. I am launching my new album, 'How Shall We Say Goodbye?' in the beautiful surround of St John's Church Waterloo. The album will be performed in its entirety featuring classical musicians Thom Allard on french horn and Hara Kostogianni on piano, who play on the album. This will be the first live performance of these songs with full band and I can't wait to share them. I will be selling a limited edition first run of the LP in advance of the fully mastered version which will be released in early 2016. For full event details click, here. The morning after two solid days of recording I went for a walk along the beach front and made this video to celebrate. It was an amazing feeling and a huge achievement for all involved. There were points where I just didn't know how we were going to get it all done. The trickiest thing to manage is the energy levels. Recording takes live and fitting ten tracks into two days means pretty much sustaining full performance level on everything you play for twenty hours plus. The joy of completing knowing we'd succeeded was immense! I am currently recording my new album at Big Jelly Studios in Ramsgate, with classical musicians Thom Allard on french horn and Hara Kostogianni on piano. We have a small budget which means a tight schedule, laying down ten tracks in two days. This requires an enormous amount of energy and concentration as we are recording all tracks live, playing all together in the beautiful acoustic of this converted chapel. The creative process of collaborating with musicians and producers to bring these songs to life is an incredibly exhilarating experience and I can't wait to share them. The fully mastered version of the album, 'How Shall We Say Goodbye?' will be released in early 2016. Needless to say, we were extremely touched to receive this note through the door during our final rehearsal before recording the album. We took it as a sign of positive encouragement for the creative work we were about to produce. I am excited to announce the recording of my first studio album this October at Big Jelly Studios in Ramsgate. The LP will be titled, 'How Shall We Say Goodbye?' and will feature classical musicians Thom Allard on french horn and Hara Kostogianni on piano. The album will be recorded live in the beautiful acoustic of this converted chapel. The fully mastered version will be released in early 2016.
inaugural square roots gig announced! I am set to kick off the first in an exciting series of gigs to celebrate the richness of the Anglo-American folk scene planned to culminate in a festival in Greenwich Village, New York City. This was the hub of one of the most prolific concentrations of ground breaking artists during the 1960's folk revival and performers emerging from the scene such as Bob Dylan and Joan Baez were a formative influence on my earliest inspirations as a musician. On Feb 22nd 2015, I will perform alongside Dan Evans, the UK's leading dulcimer player at award winning folk venue the Green Note. Square Roots aim to create an archive for future generations of music of this era as well as providing a platform for contemporary artists that draw inspiration from this scene. I'm thrilled to be a foundational artist performing at the inaugural gig to launch this incredible project. For event information on the gig click, here. For more on the Square Roots Charity click, here. Busking at Borough Market today I connected with the founder of an exciting new project, the Square Roots Charity. Liz Thompson dropped a flyer in my case with the heading, 'Bringing It All Back Home,' Washington Square, New York City. A heady mix of an album by one my favourite artists, Bob Dylan, and a theme for a festival which harks back to my favourite place and period in musical history, the 1960's Greenwich Village Folk Revival. Liz and the Square Roots team have a dream to put on a festival of music that celebrates this unique moment in musical history which became a catalyst for a transatlantic reinvigoration of folk. Square Roots and I plan to collaborate on one of a series of gigs taking place in London and NYC throughout 2015 to raise funds for the Bringing It All Back Home Festival. You can read an overview of the the project at Folk and Honey if you click, here. I am thrilled to announce that out of thousands who applied to audition for a TFL Busking Licence, I am one of the few musicians who was successful. I auditioned for a panel in Leicester Square singing amplified to the judges and to those that happened to be enjoying the sun on their lunch break. I sang two covers, as requested, Van Morrison's 'Into the mystic,' and Joan Baez's 'Diamonds & Rust.' Busking is an invaluable resource to me. It provides space to feel into new material and hours of practice time with an enhanced focus, because everything I do is in front of an audience. The beauty of busking is in the spontaneous connections which unfold with passers by. Each and every coin in my case is there because someone has connected with the music enough to go out of their way to offer something in return. Sometimes its a smile or a spring in their step and that's just as valuable. I am delighted tobecome a part of the London Busking Scheme. For more information on the TFL Busking Project, click here. A video to enter the TFL Busking Auditions 2015. With more demand for licenses than ever before, musicians who a successfully chosen based on their video entries, will perform X-factor style in front of a panel of judges in Leicester Square to compete for a licence to busk on the tube. For more information on the TFL busking project, click here. Live recording of an acapella performance from my solo classical recital at St John's Waterloo on Friday the 16th of May. This 13th century song is written in Medieval Portuguese and tells the story of a nun who falls pregnant and begs the Virgin Mary for a miracle. The Virgin Mary answers her prayers inducing a birth that leaves the child unharmed and the nun untainted. This Saturday I performed with the Reggae Collective, OneJah at Royal Festival Hall. We played as part of the Adopting Britain Festival celebrating 70 years of migration at the Changing Britain Exhibition. Maurice OneJah the founder and creative director of the collective was also interviewed as part of the exhibition about his experiences of migrating as a small boy from Nigeria to London and about an instrument he brought with him called the Ekwe. You can see part of this interview if you click here. More details about the event are accessible if you click here. The Changing Britain Exhibition takes a positive and inspiring look at the richness and diversity of British culture developed because of our contact with those of other nationalities. My first project of 2015 is a video for the NPR Tiny Desk Concert Competition. NPR Music podcast 'All Songs Considered' is an old favourite. The Tiny Desk Concert is a platform whereby artists are invited to the studio to play their music around a small desk. You can take a look at Martha Wainwright's performance here. Now officially all entrants to the competition have to be from the United States, but shhhh! I hope that someone might watch the video and like it before they realise I am a Londoner ;). This show has a special place in my heart as it's opened the door to so many new music discoveries and it would feel very significant to play. The winner will be announced on February 9th 2015. You can have a look at some of the other entries here. I recorded an acoustic session with Sean De Souza at SDX Records on Sunday 16th of March. I played some Tom Waits covers and a few of my own songs. Sean is orchestrating some of the tracks. You can listen to my version of Love Song To A Stranger, by Joan Baez, recorded during the session, by clicking the image below.. I have been selected from auditions across London to be one of 150 musicians collaborating to devise and perform a new song cycle celebrating London's Zeitgeist commissioned by Barbican. I will be performing as a soloist, a member of the chamber choir and the general choir at Milton Court on April 13th and 14th, where we will be accompanied by the Youth London Symphony Orchestra. For more information click the image below.. I bumped into Steve Marriott, a writer, in the underpass where I busk in Forest Hill and he responded with this blog post. 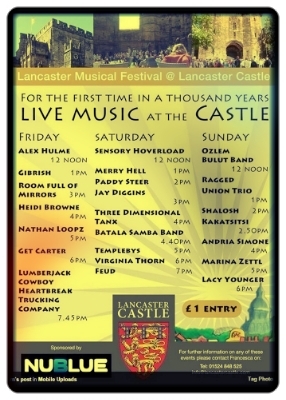 To read it click the image below..
Lancaster Castle is to host music for the first time in the six year history of the Lancaster Music Festival. I am excited to be playing one of the headline slots inside the castle! I will be on stage at 18.00 on Saturday 12th of October. For more information click the image below.. 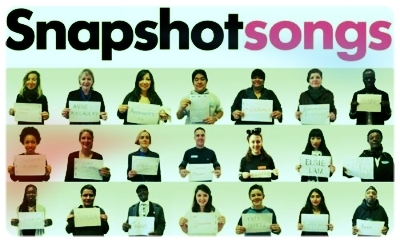 Following the success of sold out shows at Milton Court in April, I will be taking part in a recording of the score for Snapshot Songs, a song cycle celebrating the Zeitgeist of living in London. I will be contributing as a soloist, a member of the chamber choir and the general choir. Recording will take place at Angel Studios on Sunday 9th of November, where we will be accompanied by the Youth London Symphony Orchestra. The release date for the recording will be announced in the new year. Click the image below for more information..